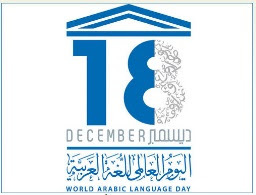 In 2013, the United Nations declared December 18 as the Arabic International Day, which was chosen because it was the date on which Arabic was accepted as one of the six official working languages ​​of the United Nations in 1973. Arabic is one of the most spoken languages ​​in the world. More than 422 million people around the world live in the Arab world (Al-Watan al-Arabi) and in the surrounding areas and speak Arabic. Arabic is one of the ancient Semitic languages. The Koran, the Muslim holy book, is written in Arabic and is considered the Islamic holy tongue. Online Arabic is among the 4 most common languages. Arabic influenced other languages ​​in the Islamic world such as Turkish, Persian, Kurdish, Urdu, Malay, Indonesian and Albanian. European languages ​​such as Spanish, Portuguese, Maltese and Sicilian are also influential in the Arabic language.